As Kenny Chesney prepares for his 2015 The Big Revival Tour, his No Shoes Radio internet station will be featuring a two-hour special to preview the tour. 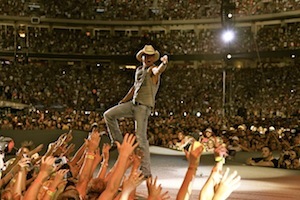 “Big Revival Tour Preview Special” will air at www.noshoesradio.com on Wednesday March 28 at 12 p.m. ET and will be packed with music, memories, fan blasts and memories from every market on the upcoming tour. It will go into a rotation daily for the next week around the world via noshoesradio.com, the Kenny Chesney & No Shoes Radio mobile apps, and via distribution partners TuneIn, iHeartRadio, and iTunes Radio. The tour will kick off with two shows at Nasvhille’s Bridgetone Arena on March 26 and 27.